Last year when I was loading up the DRZ in the garage in preparation for riding to the Berkshire Big Adventure dual sport ride, I had a teensy-weensy mishap with a bungee cord. While strapping my tent down, I let the cord slip. When it recoiled, it hit me square in the eye. In that infinitely long moment, before the pain settled in I had time to consider that I might’ve blinded myself with the hook of a bungee cord. Thankfully, I made it through with my eyesight and eyeball intact. I also came away with the need to find a better way to strap things down to the bike. Enter ROK Straps. ROK Straps are flat, adjustable, elastic straps. The motorcycle version have no hooks to scratch your bike. Instead, they use a loop & clip set up. They come in different widths, lengths and can even be made to custom lengths. They claim to be the stronger, safer alternative to bungee cords. I’ve been using them since last year and have been very pleased. I always keep at least one attached to the rack of the DRZ. That’s right, baby! One. Dozen. Donuts. Have you used ROK Straps? Do you find them to be more effective than a traditional bungee? I discovered Rok straps last year and have been very happy with them as well. I only use them with my camping gear. Way back when I used to bicycle tour, I avoided bungee cords like the plague. Straps work much better and the elastic on the Rok straps is a significant improvement. Another ROK convert here. They’re great for strapping down my waterproof duffle bag on the pillion seat. Looks like I’m late to the ROK Strap party! I also had the bungee to the eye scare. Ended up just a blood spot on the white of my eye for a couple of weeks. I ordered a sheepskin seatcover from Alaskaleather last month and included the ROK straps as an impulse buy from their website. So, far, I’ve only used them to hold down a small pack on one ride and I’ve already decided a pair of them will stay on my Sprint all the time. 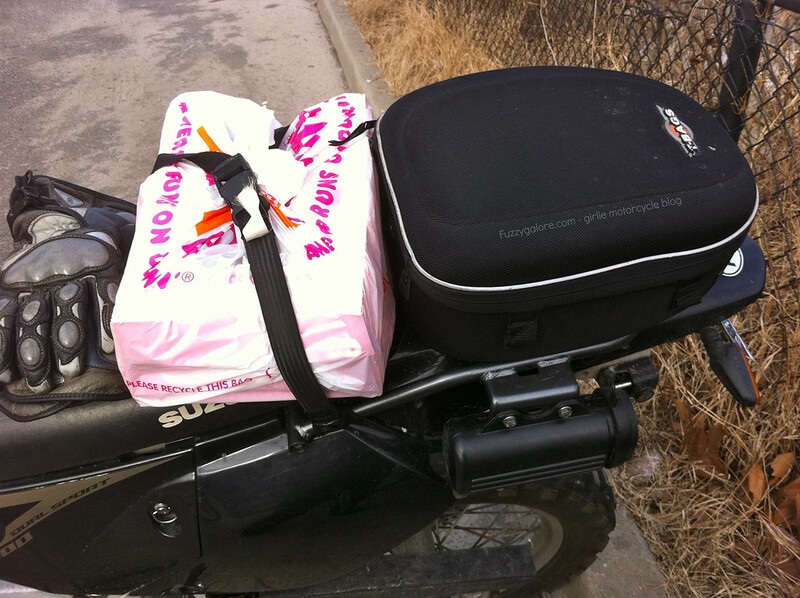 The adjustable length plus elasticity is perfect for holding non-rigid items like donuts without squeezing too much. I’ve squeezed the groceries too many times. I’m hoping these are the solution to that as well as holding my camping gear dry bag on long rides. Ugh, sorry to hear you almost took your eye out, too Keith. Curious… most of your recent posts involve the DRZ or the whale. No love for the Triple lately? Will ALWAYS love it. Was going to ride it yesterday but I’ve had a nagging slow leak in the rear tire. They were about due for replacement, anyway. It’s getting new tires on it as we speak! I thought I broke my hand once after a bungee when out of control. I don’t know if I’ll switch products or keep fighting the good fight, but it’s nice to know there is a viable alternative to potential blinding on the market. Broken hands – near blinding – scalping… Time to move on, Brady! I bought a set recently but haven’t put them to use yet i’m glad they are effective, i’m looking forward to trying them out. Where did you loop them on the DRZ? The frame? Do you have a rack on yours, Ben? I just keep them strapped and pulled tight through the rack rails, in front of my tailbag until I need them. Mine doesn’t have a rack yet which one are you using? I’ve had mishaps too, but never as close to an eye as you. These look fabulous. Thanks for sharing the find! Hope they work out for you too, Pam! My Dad had a run-in with a bungee. The hook actually sliced his head open though, not far from the eye, requiring a trip to the ER and stitches. I think of him every single time I use a bungee on the bike. Looks like I need to get me some of these. Looks like I need to add another part to the list hah! I have a set of the large ones and a set of the small ones. I love them, so much more useful than a bungie cord and much more secure. 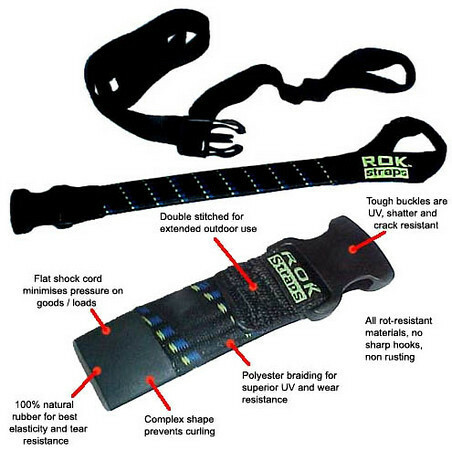 We are the distributors of ROK Straps, and love reading about how customers enjoy using ROK Straps. Check out our full line of straps and ROK Dog Leashes at http://www.rokstrapsamerica.com. Thank you for this, it’s ridiculous that bungee cords are still on the market and not banned, ‘y husband and a similar “fight with a bungee cord” as we call it, in the garage and lacerated his retna, and eyelid and after days in our states top trauma ward his eye has been declared permanently blind. As a tactical trainer this has been a horrid experience, hence my coming across your site in search for a “bungee cord alternative Christmas gift”. Bungee cords should be put out of use, the eye doctor had informed us that bungee cords and socket plugs are responsible for the majority of their trauma patients they see.